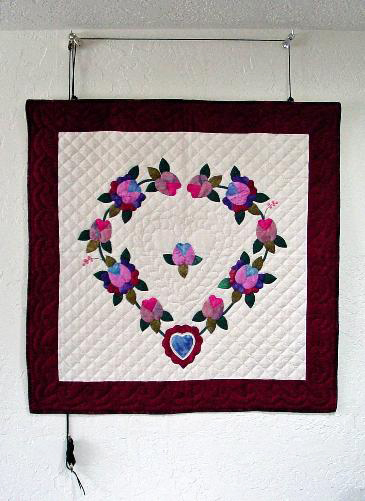 High-Hanging Quilts with Pulleys: Use "No See Ums"™ Invisible Quilt Hangers. Would you like to hang a quilt somewhere up high and then be able change it from time to time? Perhaps you have a high wall somewhere in the house -- in the foyer, above the staircase, or in a vaulted ceiling living room. Perhaps you are hanging decorative fabric art in a library or workplace exhibit. We can help! Choose your quilt sizes, choose to hang on ceiling or wall, and choose your tie-down point. We can design a pulley system which will allow you to change your decor at will because it will be easy to raise and lower your quilts just standing on the floor. If you have a high wall, you may download a form to complete below and email or fax it to us with your specifications. 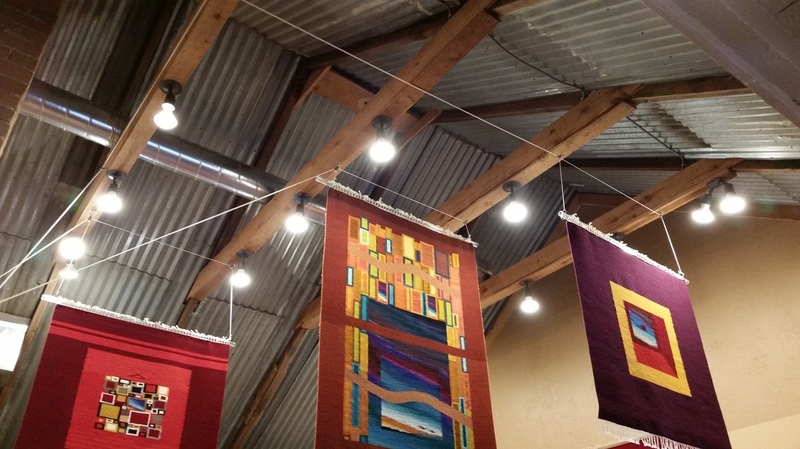 If you choose a ceiling system, we can design for back-to-back displays and even stack multiple quilts ! Install once and enjoy ! Pulleys are super for High Walls. white wall. This is just so you can see it clearly. You would use white cording, so it would be less visible against a white wall. Cording is also available in custom colors. Also, the tie-off hardware is located below the quilt for the sake of the photo. You might choose to tie down behind the quilt, or to run the cords along the top of the wall and bring them down to tie off some distance away from the quilt, at a location convenient for you to use. Scroll down to choose the applicable form for your wall pulley design and to write down your specifications to email or fax us. 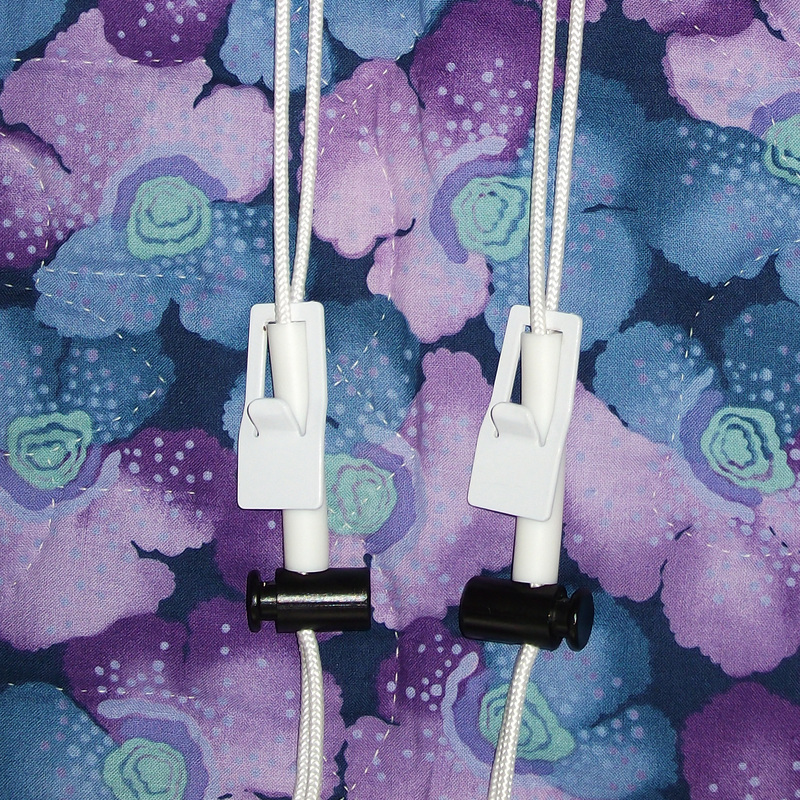 Pulley systems can be used with the "No See Ums"™ invisible quilt hangers using brackets specialized for cording. AND since the bars are telescoping and therefore adjustable, you can even hang quilts of varying widths with the same pulley installation. The height of the hung quilt can also easily be adjusted with the cords, from the floor, to accommodate different lengths of quilts. 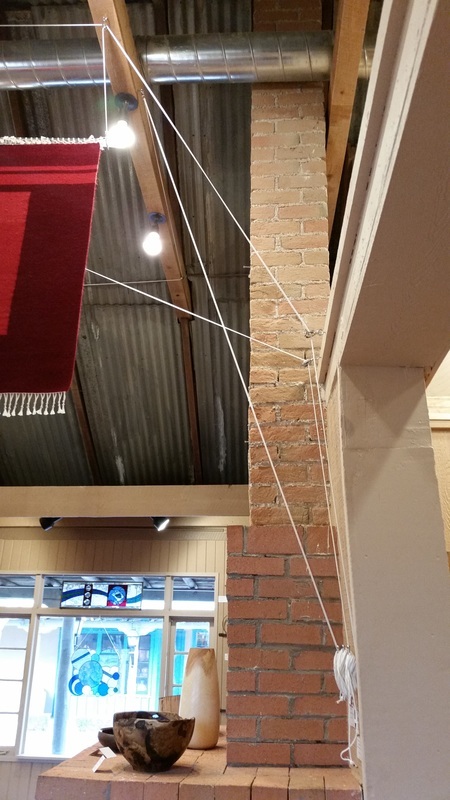 Pulleys are amazing for Ceilings. Simply raise, lower, and adjust with cords while standing on the floor. Raise and lower with cords as you would with blinds. Shown: White lanyard brackets, which will be used to hold your telescoping bars. 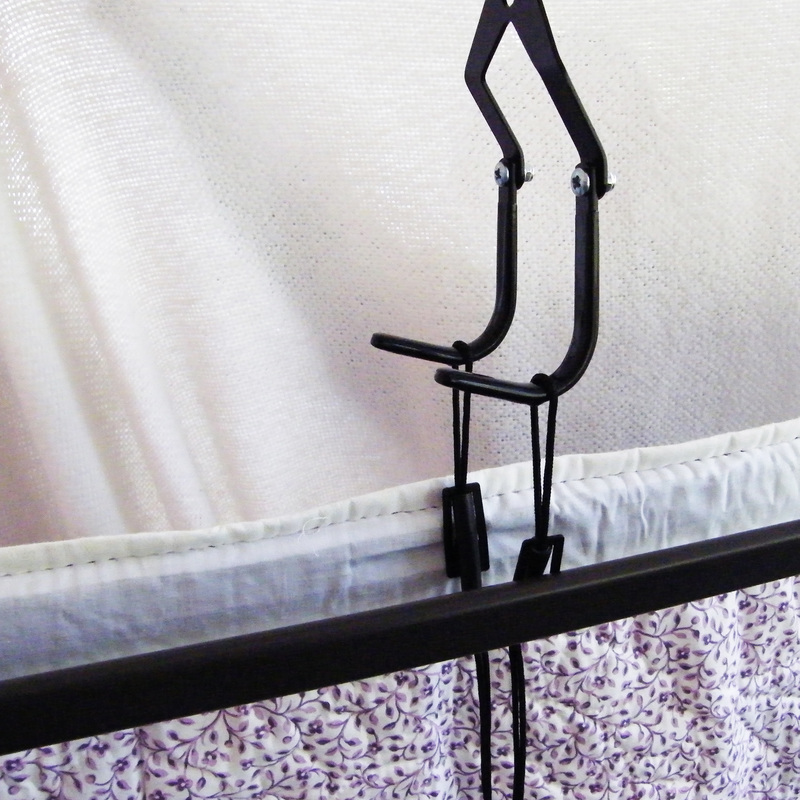 Shown: Black lanyard brackets hold bars with additional hooks used in some special hanging applications. Back of sleeve is shown on one quilt, while only the bare bar is shown in front. Each application has design opportunities and challenges. Let us help you with bringing for the creative interior design possibilities you imagine. These hangers are custom designed for you. If you are interested, please download the appropriate sheet below, and then phone or email so we may discuss your needs and specifics further. We look forward to helping. 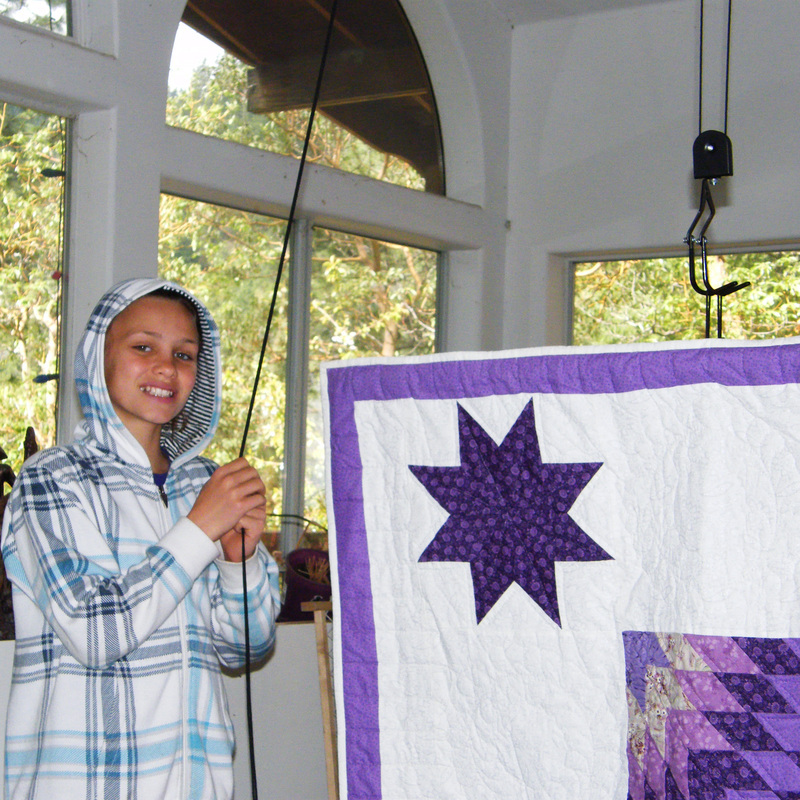 Hang two or more Quilts side-by-side. Hang two or more Quilts stacked vertically.